For those students desiring to improve their mastery of English, I have found that nothing works better than the Word Web. A Word Web is a way to graphically organize facts, ideas and/words and can help you learn and remember new English vocabulary. Using Word Webs to learn English is an incredibly efficient way to gain new vocabulary and understanding without having to learn the precise definitions to every word (which can, of course, be later gleaned from advanced reading, instruction, etc.). It also provides English students with different forms of the base word, thus they do not simply learn the word “quick”, but also quickly, quickness, etc. All of this is easily accomplished with a single instrument: Merriam Webster. On this website, there is a large box with several tabs; the only two we’re interested in are the Dictionary and the Thesaurus. The Dictionary lists the definitions as well as the other members of the word family. For example, you can search for the definition of “happy” and write this down in your Word Web, as well as different forms of the same word like “happiness” or “happily”. The Thesaurus lets you find synonyms, antonyms, and related words. 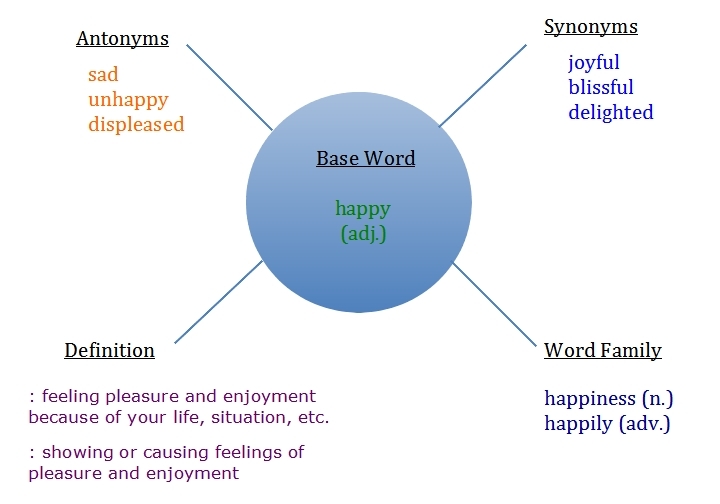 If you search for “happy”, you’ll see synonyms like “joyful”,”blissful” and antonyms like “sad”, “unhappy”. You can write these down in your Word Web. The level of definitions, synonyms, antonyms, etc. can be changed depending on the audience: relatable for lower levels; academic for advanced levels. All synonyms and antonyms should match the part of the speech of the original word (though this is not a hard and fast rule), and these Words Webs should be recorded in a notebook for later reference. esl-blog english vocabulary, learn English, tips for english. permalink. Why Study English in Denver? For the Weather, Of Course!